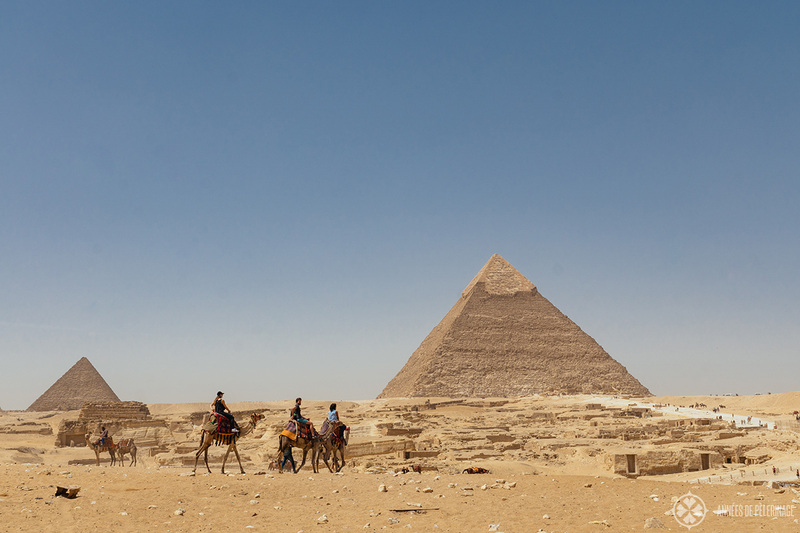 Plan the perfect Egypt pyramids tour – what to see, when to visit and where to stay. 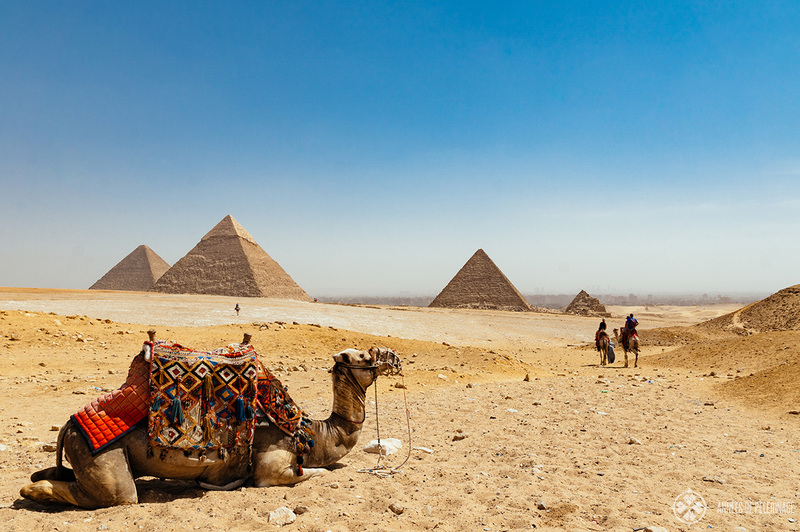 Are you dreaming of a tour to the Pyramids in Egypt? Are you wondering about the best time to visit and if it is safe? Then this guide is all you ever have to read. I’m going to show you how exactly you can visit the UNESCO World Heritage site all by yourself, saving money and not missing out a thing. Also, make sure to read my list of the 20 best things to do in Egypt, as there is so much more to explore. Your tour starts at the parking lot in front of the main entrance. The whole Giza plateau is fenced in and not accessible without a ticket. Tickets are sold at the entrance and there is no need to book them in advance through a tour agency. 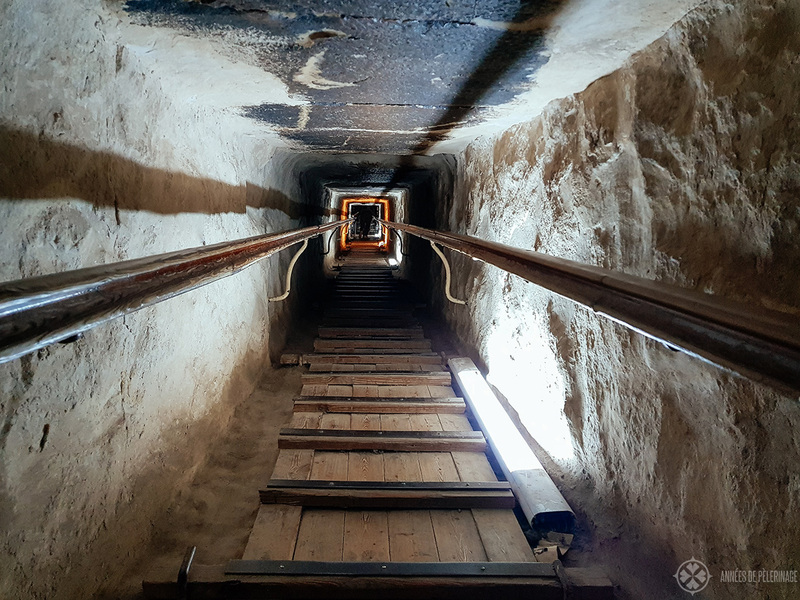 If you want to go inside the Great Pyramid of Khufu you should know that only 150 people are allowed inside during the morning shift and another 150 in the evening. 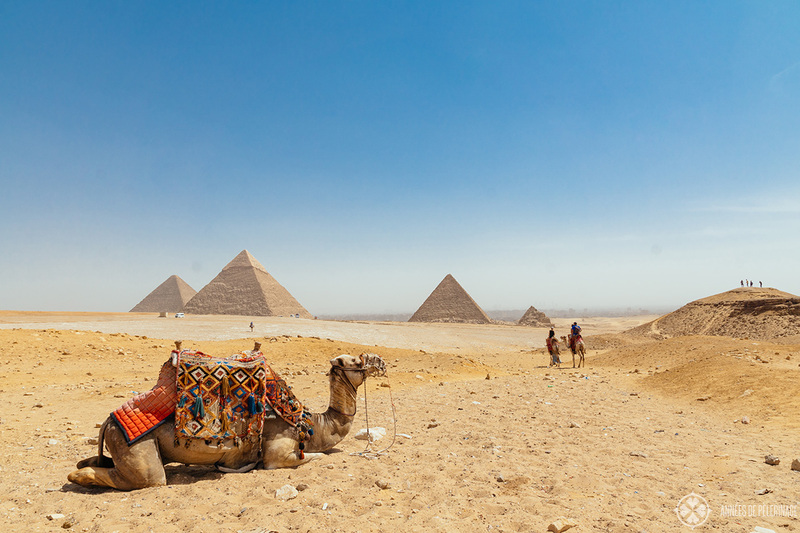 You got a couple of ticket options for touring the of the great pyramids of Giza. 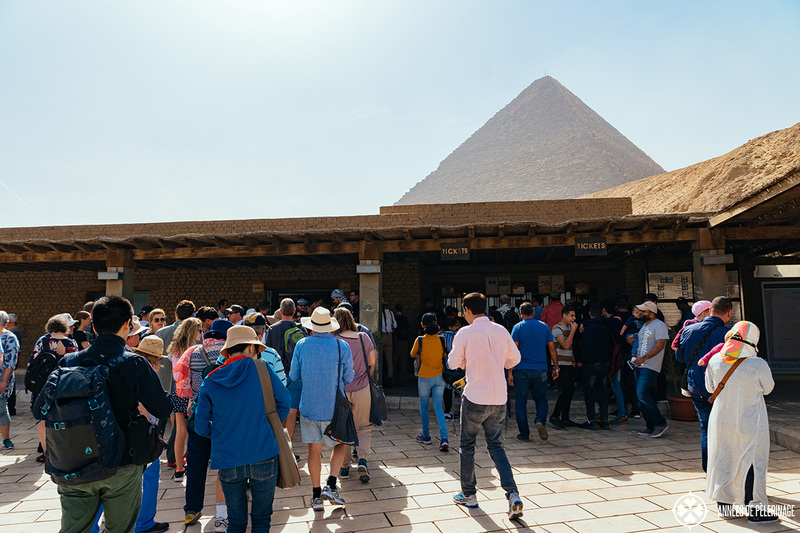 The standard ticket will only allow you to walk around the whole plateau and entering the three Queen’s Pyramids, while you will need an extra ticket to go inside the Pyramids of Khafre and Khufu. Note: Ticket prices for the Pyramids have been steadily increasing over the past couple of years. 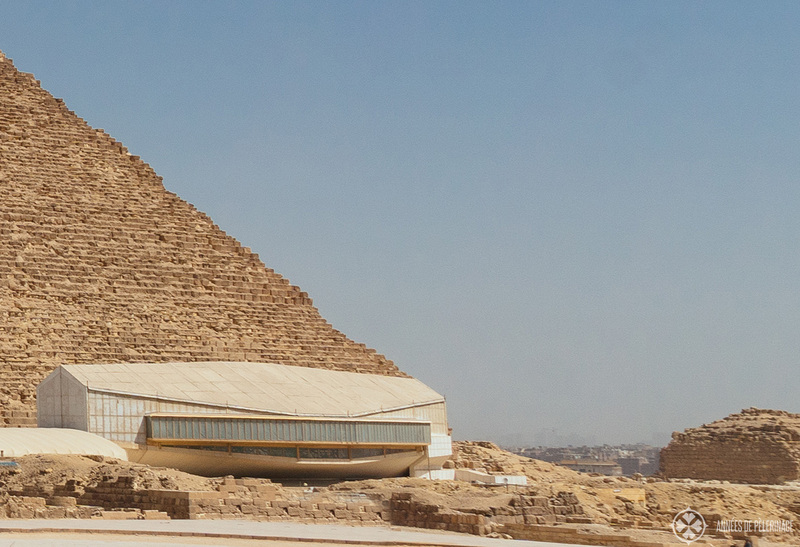 It is only a short walk from the main entrance to the imposing Pyramid of Khufu. Be wary of souvenirs and camel rides offered to you right after the entrance (just ignore them and say “no, thank you”) – especially when more than one Egyptian approaches you. Also, don’t hand your camera to one of them offering to take a picture of you (instead, ask a fellow European/American). Guides may bring their car inside, and actually, it will be quite strenuous to explore the whole area on foot. Though, it is always possible to hire a camel ride. There isn’t actually a lot to do around the area. Just marvel at the sheer imposing size and take your time taking pictures. The ground is mostly sand and bigger stones, with some paved areas in between, so sturdy walking shoes or sandals (if you don’t mind the sand) are recommended. Note: It possible to climb up the Great Pyramids? It is strictly forbidden to climb to the top of the Great Pyramids. If you want to take a picture, you have to be content with climbing the lower steps. If you plan to take a tour inside the pyramids, then you will need a special ticket (currently 300 EGP). The Pyramids of Khufu (which is the largest of the lot) is the most popular among tourists. Sadly, grave robbers emptied the pyramid long, long ago, so don’t expect to see gold or any other form of adornment. In fact, the whole pyramid is literally empty. Does this mean you shouldn’t go? Quite to the contrary. First of all, there is the Grand Gallery of the Great Pyramid of Giza. A massive ascending passage of some 47 meters and a height of 8,6 meters. Climbing through this gallery imprints you with the almost palpable feeling of those millions of millions of tons of stone above you. Moving onwards, you will be able to enter the King’s Chamber. Quite a small granite chambers with the empty Sacrophagus of pharao Khofu (?) in the middle. Some believe this room in the middle of the pyramid (it is in fact not in the center) is an energy vortex. The sarcophagus is quite rough, which led to a lot of speculation. It was not uncommon for a sarcophagus to be irreversibly damaged on the way from the quarries into the tomb, creating the need for a fast (and thus simpler) replacement. There is also the so-called Queen’s Chamber, but this one is not open to tourists. The same applies to the subterranean chamber beneath the Great Pyramid of Khufu. Note: It is incredibly hot inside the Great Pyramids. Also, the passages upwards are quite narrow and steep, so you will more or less crawl on your hands and feet. You are not allowed to bring cameras inside (smartphones are fine). The Pyramid of Khafre is the second pyramid on your tour (roughly 1.000 meters away from the entrance) and only slightly smaller (136 meters). The major difference is the remnants of the outer smooth limestone encasement at the very top of the pyramid. Once the outside of the pyramids was totally smooth and possibly covered with big hieroglyphs and colorful paintings. Earthquakes and subsequent looting destroyed the outer layer, which the locals used as building material for the mosques and madrassahs in Cairo over the centuries. 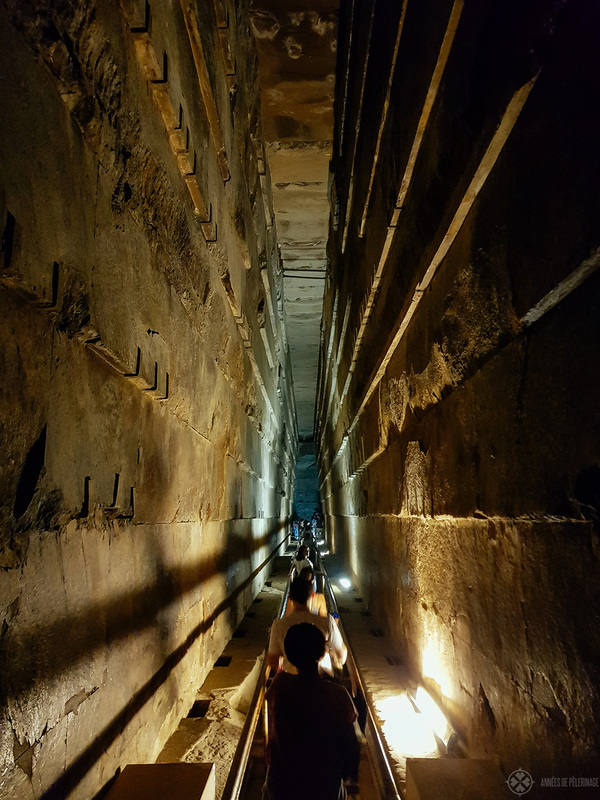 Again, it is possible to go inside the Pyramid of Khafre, but there is no grand gallery like in the adjacent Pyramid of Khufu. So, except you are an Egyptologist or an avid fan of ancient Egyptian culture, there really is no need to go inside. You don’t need to climb as much, though, as the burial chamber is almost level with the entrance. 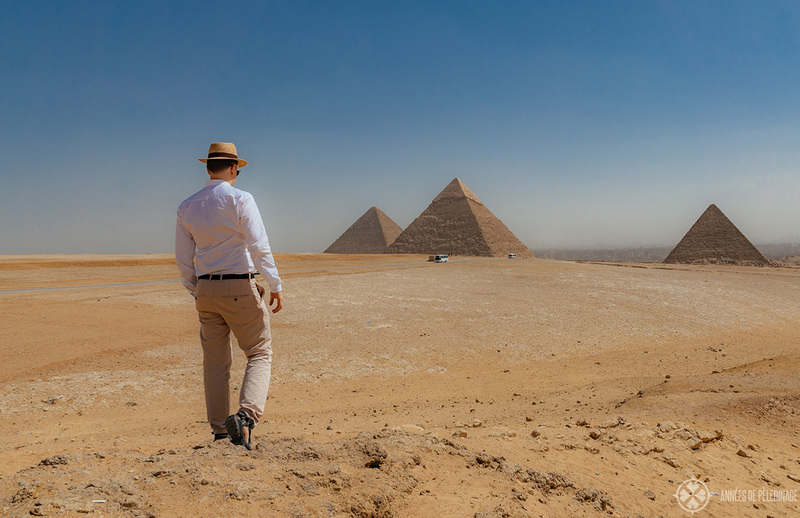 The Pyramids of Giza are impressive, no matter where you stand, but there are three distinct points of interest you shouldn’t miss. The first and easiest spot is from in front of the Sphinx (see below), so I won’t cover it here. 1. If you follow the road from the main entranceway past the Pyramid of Menkaure, you will come to a little hillock where you can see all three great pyramids. It is here most of the camel rides start. There is a parking lot (with some souvenir vendors). From here, you can shoot one of the three classic shots. 2. If you want to have all 6 Pyramids neatly aligned, you have to take a camel to take you to that sweet spot in front of the Pyramids of the Queens. You could theoretically also walk from the Pyramid of Mankaure, but it’s still quite the distance. 3. Before the Aswan High Dam was built, the river Nile actually came quite close to the pyramids. As the Nile valley is considerably smaller these days, you won’t be able to reproduce these old pictures you see everywhere with barges and palm trees in front of the Pyramids. Sorry, there’s just desert these days. 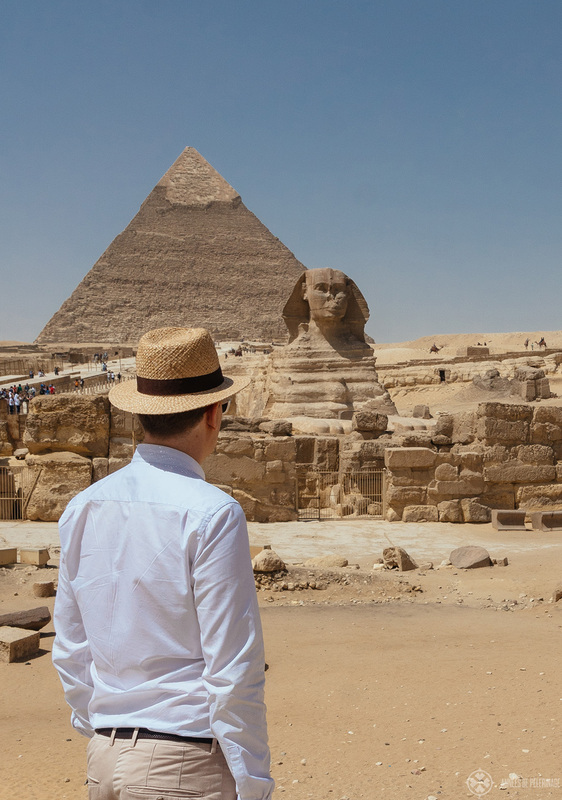 No tour of the Great Pyramids of Giza is complete without visiting the Great Sphinx. Many myths surround the remarkable statue with a human head and the body of a lion. 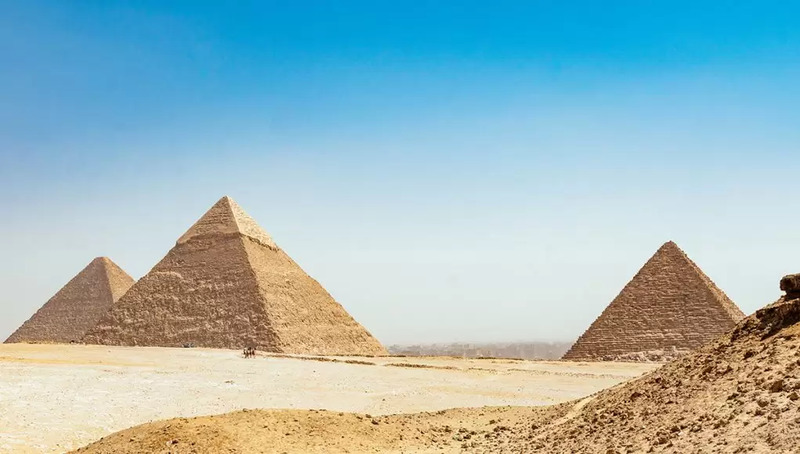 It is generally believed to represent the Pharaoh Khafre (who built the Pyramid behind it), but there are some speculations it is in fact way older. The Sphinx is some 73 meters long and 20 meters high and the oldest known monumental sculpture built by the ancient Egyptians. 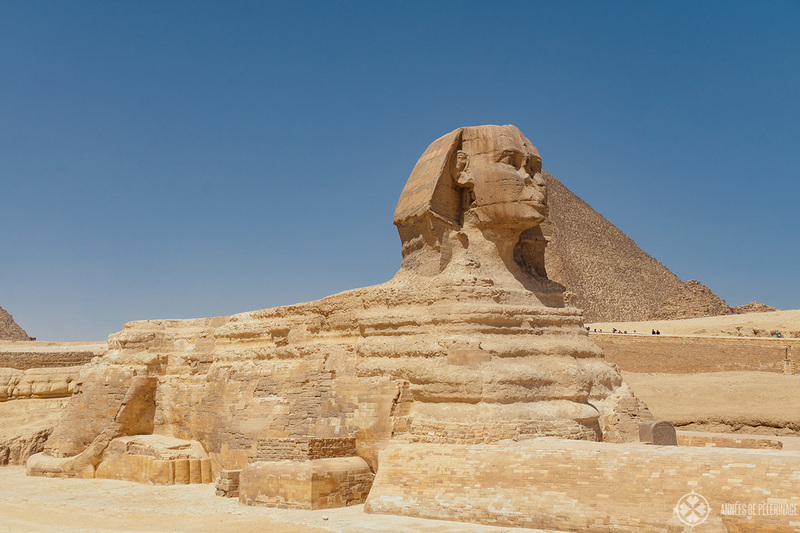 I’m not going to delve into all the different theories regarding its creation, purpose, and demolition, but I’ll just state that Napoleon definitely didn’t fire a cannonball which led to the destruction of the nose of the Sphinx. Sketches predating Napoleon’s birth already depict the Sphinx without it. Right next to the Sphinx you will also find the Valley Temple of Khafre. You see, back when the Pyramids were built the Nile reached quite close to them. The temple and Sphinx mark the original entrance to the whole funerary complex. A causeway then led to the funerary temple and onwards to the pyramids. While the Pharao was buried inside the pyramids, his ancestors and priests used the temples in front of it for prayers and devotions after his death. The Valley Temple of Khufu is more or less lost, so Khafre’s temple is the only place where you can get a glimpse of how the whole complex might have looked once. 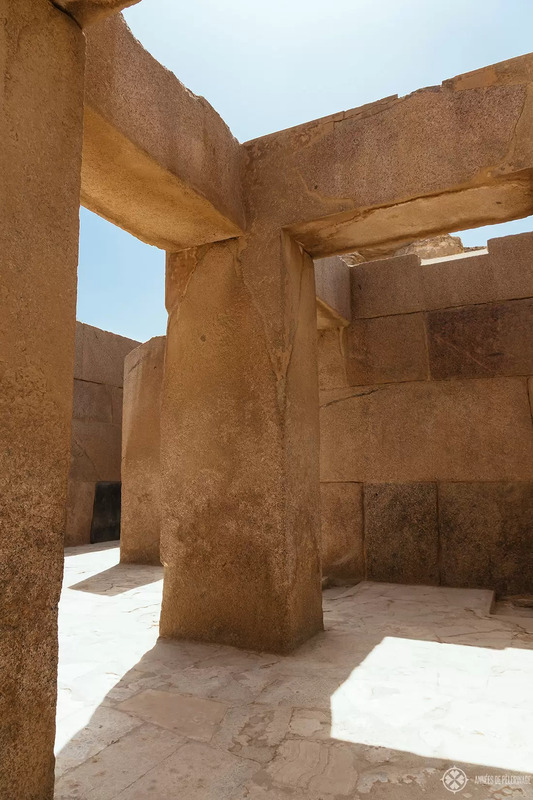 On your tour through the temple, take note of the megalithic blocks used to build it. Some of them weigh as much as 400 tonnes! 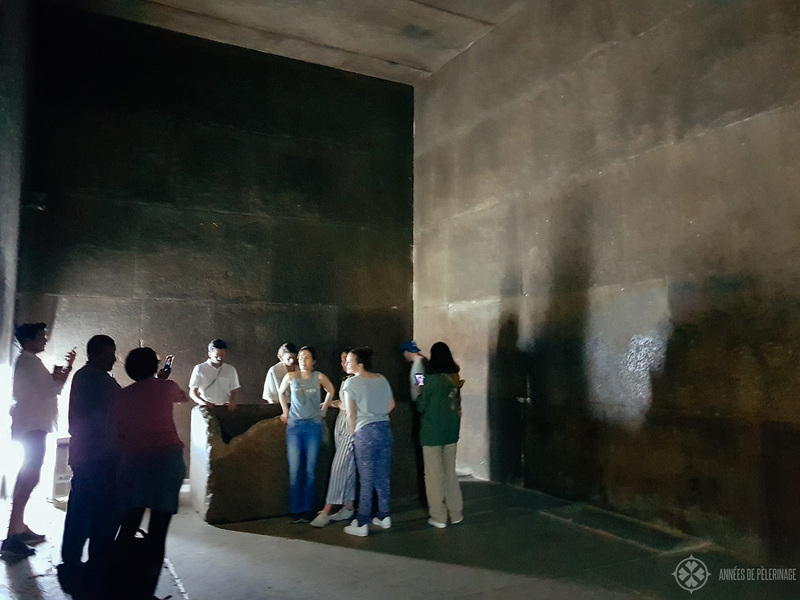 Right behind the pyramid of Khufu hides one of the secret highlights of the whole site. It is here Kamal el-Mallakh rediscovered two intact ships made of cedarwood from around 2500 BC. The barge was likely intended for use in the afterlife and has been meticulously reconstructed. The resulting effort is now on display inside the Giza Solar boat museum. The barge is quite large (143 feet / 44meter) and may actually have been put to use during Khufu’s life. Such barges played a role during the funerary rites (mainly to transport the king’s body from the embalmment tent/temple to the burial ground) and during pilgrimages (if you tour on to the valley of the kings, you will see plenty of barges on the walls of the tombs). How and if this felluca ever really was used will probably remain a mystery for all time. But it’s still worth a visit and almost impossible to imagine how this ship is more than 4.500 years old. One of the secret places to tour around the Great Pyramids is the Tomb of Meresankh II. The tickets are quite expensive (and not always available as far as I know), but here you get the chance to visit one of the so-called mastaba (burial house) of ancient Egypt. If you plan to visit the Valley of the Kings, then you may want to skip this. Otherwise, it will give you the unique chance to see an actual Egyptian burial chamber with intact murals and statues (the sarcophagus has been removed and is now in Boston). The easiest and most relaxing way to get to the Great Pyramids of Giza is by taxi. If you take a local taxi (and not one ordered through your hotel), it’ll cost you less than 10 Dollar to get there from the city center and it will take about 20-40 minutes depending on the traffic situation. Uber is also a very viable alternative to regular taxis, and you won’t have to deal with haggling. You could also take the bus (number 800 and number 900) from Midan Tahrir to see the pyramids, but you’ll waste a considerable amount of time for saving some money. It is not possible to get to the great pyramids by metro (yet). 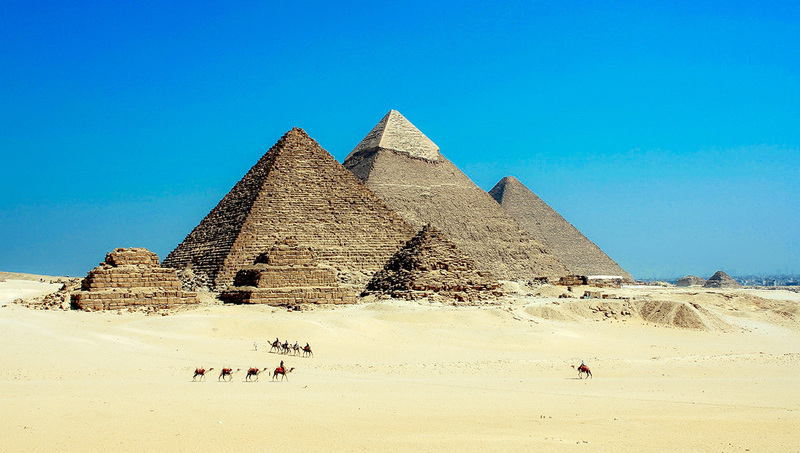 There are also frequent pre-organized bus tours to the Great Pyramids. They are usually around 30 to 60 US-Dollar and include the tickets as well. Decide for yourself if you really need a guide to explain Egyptian history to you. Personally speaking, I feel that the pyramids are basically just big (amazing) piles of rock and there isn’t actually that much to explain on site (you can easily skim through the Wikipedia article to get the most important basics). Plus, the guide is not allowed to go inside the Pyramid either. On the plus side, most great pyramid tours move on to the archeological site of Saqqara (worth it!!) or Memphis. If you plan to visit these historic sites as well, taking a standard taxi might be a bad idea. Instead of a bus tour, you can also organize a private custom tour through your hotel or a local tourist agency. They are usually not that expensive (around 100-150 US-Dollar for the whole pyramid tour), so if you are 4 people it will probably be cheaper than the bus. Plus, you got the total freedom when and where to stop and how long you should stay. Right in front of the Sphinx, there is a sound and light show every evening. The English show always starts at 7:30 pm (except in Ramadan), and there are shows in Italian, German, Spanish and French starting from 8:00 pm (click here for the official timetable). Is it worth it? Quite frankly, it’s nothing worth a detour. 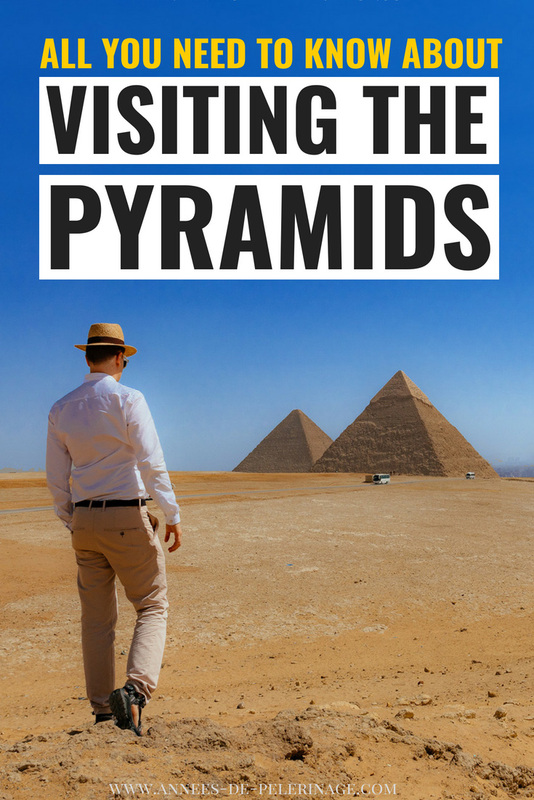 If you are staying in a hotel close to the Pyramids, then, by all means, don’t miss it. But other than that it is a bit too kitschy for my tastes. Basically, they use gigantic spotlights to illuminate the Sphinx and pyramids in different colors, while a narrator tells a story about the Pyramids mixing facts and fiction to great a nice narrative. They don’t use lasers, pyros or mist, and so it feels a bit outdated. Also, be aware that there are sound and light shows at a couple of other Egyptian highlights (Karnak temple, Philae, Abu Simbel, Edfu). 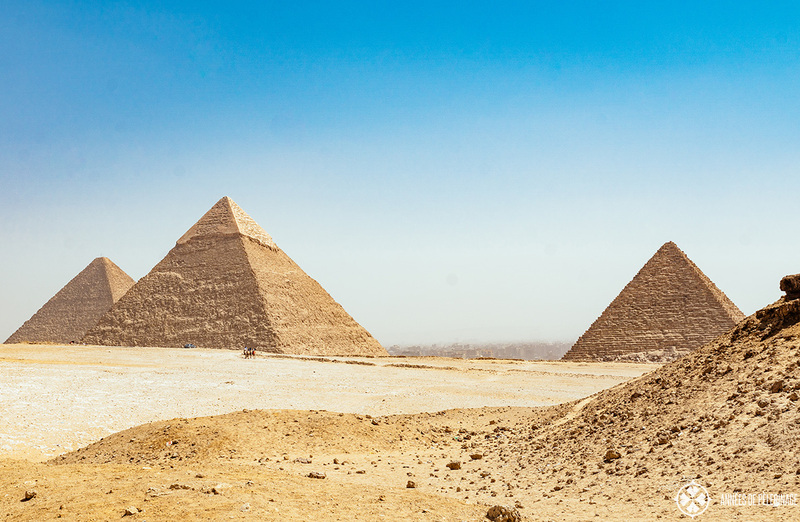 Depending on your Egypt tour/itinerary, you might want to skip the one at the Pyramids. In my opinion, it is not worth to see two light shows. E.g. I went on a Nile cruise with Oberoi and we saw the light show at the Philae temple as part of the fixed itinerary. Note: You have to take the Sphinx entrance for the sounds and light show! Is it safe to travel to Egypt pyramids? It is totally safe to travel to the Pyramids of Giza in 2018. The whole site is under constant surveillance by the military police, plus there are security checks at the entrance. In fact, it’s probably safer to visit the Pyramids than the Eiffel tower. That being said, prepare to get scammed! There are thousands of “guides” around the pyramids who are anything but official guides. Then you got all the camel rides (the closer to the entrance the more expensive), who will also charge if you take a picture of the camels. And then you got the various vendors of souvenirs who often stalk you with “presents” which turn out to be anything but presents. Use your common sense, don’t buy anything, only take a camel ride if you really must, and you should be perfectly fine. 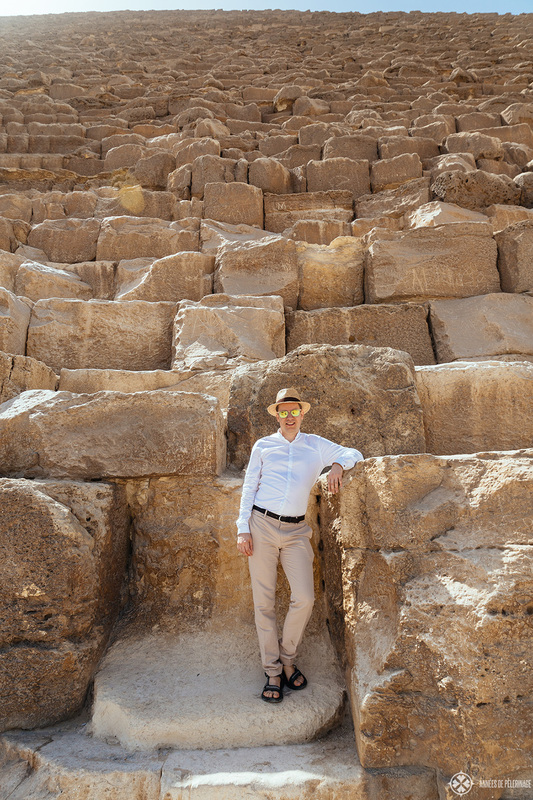 Read my full guide to travel safety in Egypt here. Cairo is a wonderful city and there are many highlights (here is a list of the 20 best things to do in Cairo). So, as a general rule, I’d say picking a hotel in downtown Cairo is probably the smarter idea. If you just got two or three days in Cairo, it doesn’t matter, though. From downtown, you will have to take a taxi to the pyramids, and if you stay around the pyramids you have to take a cab to the inner city and its highlights for one day (Egyptian Museum, Tahir place, Cairo Citadel, and so on). Marriott Mena House (Luxury): This is by far the best hotel near the Pyramids of Giza, has a stunning pool and is literally a stone’s throw away from the main entrance (this is where I stayed). If you really want to indulge yourself, this is what you’d have to pick. Up until a couple of years ago, this hotel has been run by Oberoi – one of the top luxury hotel chains in the world. So, even after Marriott took over, expect to be overwhelmed, especially as the hotel has its own private entrance to the pyramids. Check out prices here >>. 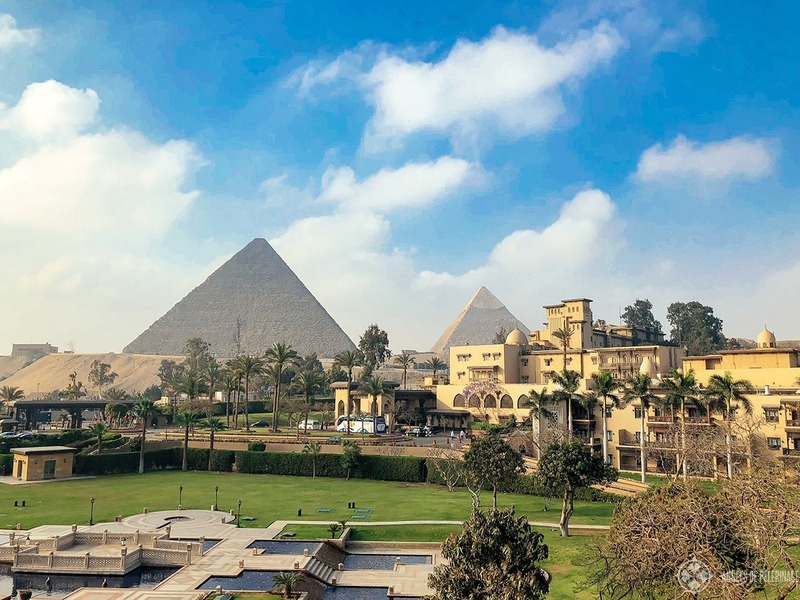 Le Meridien Pyramids Hotel (Mid-range): If you are traveling with kids and don’t want to spend a fortune on accommodations, but still want a nice view of the Pyramids and a decent pool, then the Meridien Pyramids hotel is the best choice for you. Hayat Pyramids View Hotel (Budget): For those with a tight budget, the Hayat Pyramids View Hotel could be a good option. Generally speaking, I don’t advise picking budget hotels in Egypt, because less than optimal sanitary conditions could spoil your whole vacation. Still, this three-star hotel has a lovely roof-top terrace and some rooms with pyramid views. I know, there are a couple of other hotels calling themselves “Pyramid hotels” – but none of them are truly close to the UNESCO World Heritage site. Some as far as 10 kilometers. Do check the map, before you book. 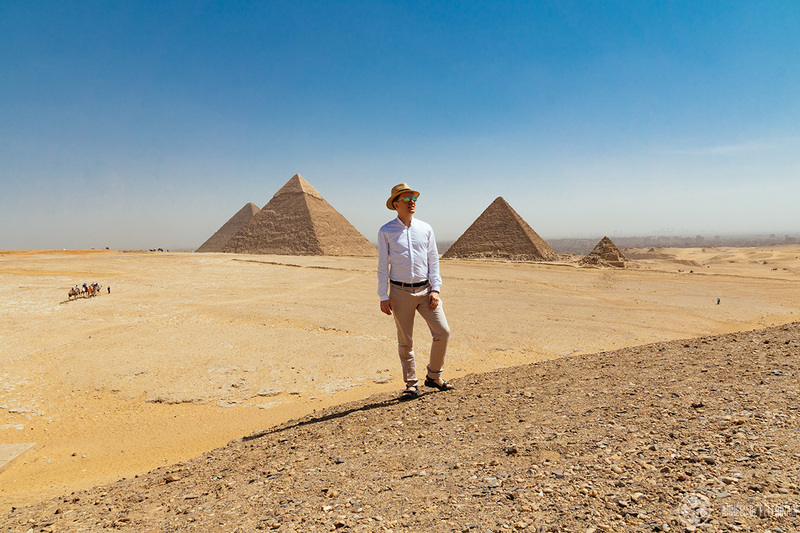 All things considered, mornings are usually better than in the evenings for visiting the pyramids, as it gets incredibly hot in the afternoon. But as most pyramids tours start in the morning, this will also be the most crowded time of the day. 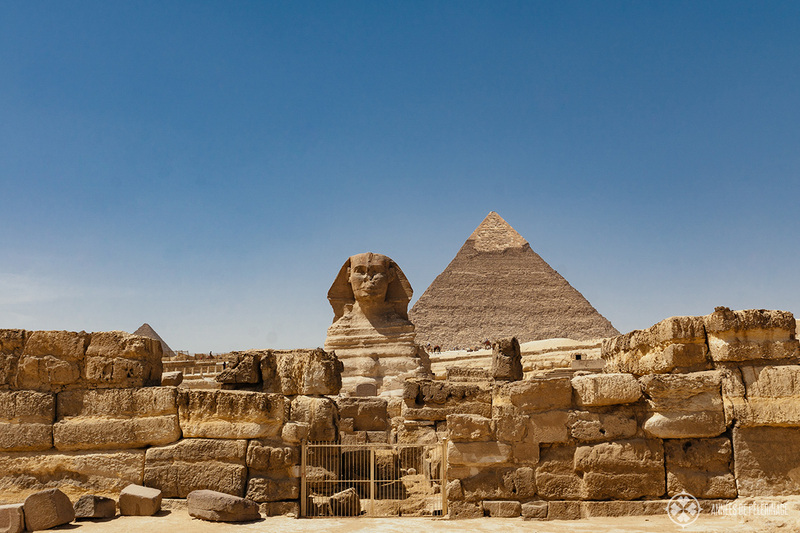 Morning is also better in terms of taking pictures, as the sun will be directly opposite the Sphinx in the morning (though even in the evening you will still be able to take good pictures, as the classic panorama goes from south to north). What time of the year is best to visit the Pyramids? Well, there’s no easy answer, but definitely avoid July and August, where it should be near impossible to go inside the ancient wonders due to the intense heat. Good months would be March until June and September until early November, as these months offer you perfect conditions for swimming & snorkeling in the Red Sea (Hurghada or Sharm el-Sheikh) while still being (considerably) cool enough to do some sightseeing. Generally speaking, Autumn has clearer skies than spring. In case you only want to visit temples and all the other UNESCO World Heritage sites in Egypt, nothing speaks against winter for your trip to the pyramids either. Hotels are cheaper, there is less of a crowd and you can explore the wonders of the Pharaonic times without breaking into a swear. So, this was my little Giza pyramids tour. I hope I was able to show you all the options for seeing the ancient Egyptian pyramids. Got any questions? Leave a comment. And don’t forget to pin this to your Pinterest board. – Could you elaborate what the duration of the ride would be for 100 EGP? – Also do you know an approximate price for different durations? Usually, it will take around 30 to 60 minutes to reach the classical viewpoint and back to the parking lot. Appreciate your prompt reply! Have you heard of instances where tour guides try to work out commissions for themselves? A private tour guide tried to give the impression that he was working out a good deal with the Camel ride guys. The whole conversation was in Arabic. He said the ride would cost 346 EGP per person for 30 minutes and that if he had not bargained, it could have costed 865 EGP per person. It was hard to figure out if the private guide was kind who would work on behalf of his clients or if he was trying to work out a commission for himself. 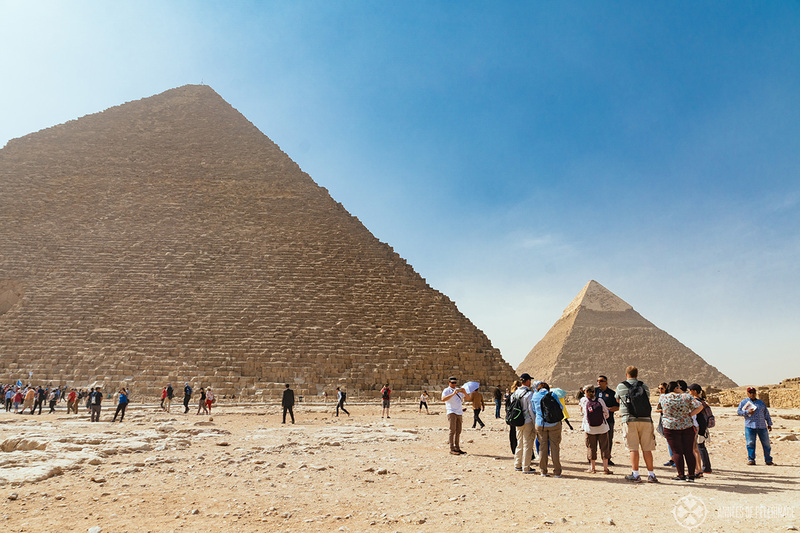 Based on your experience, do you think 346 EGP per person is way too much at Giza Pyramids? I cannot possibly answer that. In my experience, it is always a mixture. Usually guides really try to help you, and usually, they are affiliated with the one restaurant or whatever other venues. So, I would believe he haggled for you …how well..no idea. But at the end of the day, it’s always quite important to judge for yourself. If 346 EGP is fair value for you, then go. If it isn’t don’t. I wouldn’t stress over such details.